If you're a regular reader (which I know you are), you're familiar with my biweekly $20 Challenge at the Dixie Classic Fair Farmers Market. Tanya Rivera of WFMY-2 and 2 Wants To Know challenged me to a duel. No, not really--but she challenged me to create a gourmet meal for 4, only using $10--AT WHOLE FOODS. There is a reason it's nicknamed "Whole Paychecks". The organic specialty grocery store is more expensive than other stores in the area, including The Fresh Market and they take EBT, which The Fresh Market does not. This was not my first time creating a meal for four at Whole Foods. I succeeded SIX YEARS ago and the results this time was more fantastic than the first. That's right. Less than $10, including tax and dessert. Mmm hmm. Dessert. How did I do it? A little bit of planning and buying exactly what I needed. I purchased my protein first and bulked up my patties with lentils, cornmeal and wheat germ. I could have easily purchased rice, quinoa or other grain, but I liked the color of the lentils. Also, using simple pantry staples can help you achieve your meal goals with minimal funds. Split open the chicken chorizo link, take out the forcemeat and place it in a bowl. Add the ground chuck, wheat germ, cornmeal, green lentils and hot wing sauce. Mix with a spoon or your hands. 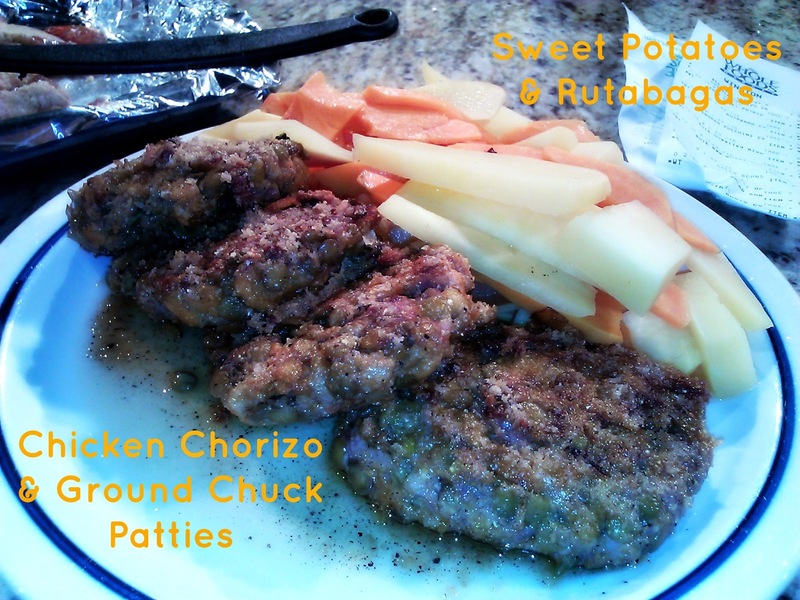 Form the mixture into 2-inch patties that are 1/2-inch thick. Heat oil in a medium skillet over medium heat. Add patties to skillet. Cook, turning once, until golden brown and cooked through, about 4 minutes per side. Scrub sweet potato and rutabaga and rinse with water. Peel skin using a vegetable peeler or paring knife. Cut into even pieces. Discard ends and hard, woody pieces. In a large saucepan, heat chicken stock until it is simmering and add sweet potato and rutabaga with salt and pepper. Cover the pan and cook for 10-15 minutes. When chicken stock and water have evaporated, take the pot off the heat and add the butter. Stir to coat vegetables. Add salt and pepper, to taste. Serve. 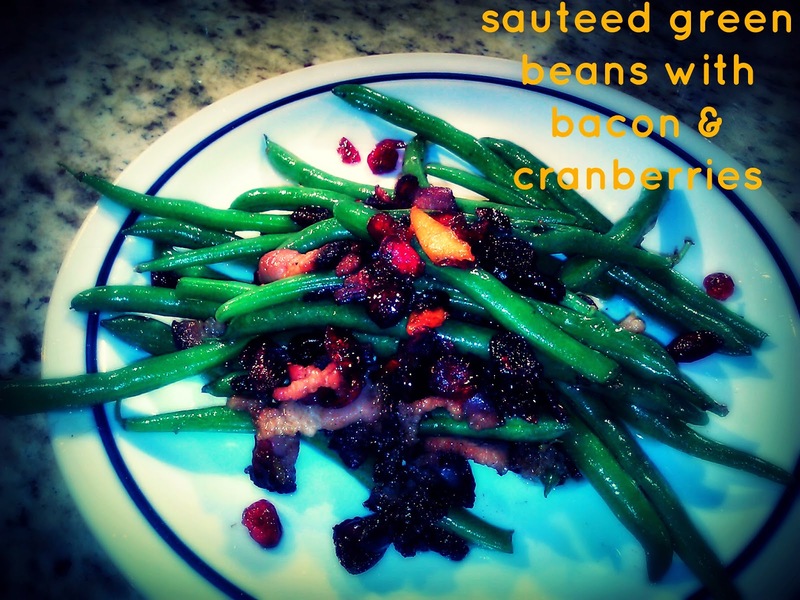 Heat large skillet with 2 Tbs of olive oil and place green beans in the pan with vinegar and bacon. Saute for about 3 minutes. Add cranberries and continue to cook for an additional 3 minutes. Season with salt and pepper, to taste. Serve. Place sliced zucchini in a bowl that can be fitted with a lid. Add red onion, white vinegar, olive oil, dijon mustard and salt and pepper. Place lid on top and shake vigorously to mix the liquid ingredients. Taste and adjust seasoning. Add sugar for a little bit of sweetness. The longer the zucchini sits, the better it will taste. Preheat oven to 350°F. Line metal baking pan with foil, leaving 1-inch overhang around edges and pressing firmly into corners and up sides of pan. Stir flour, baking powder, and 1/4 teaspoon salt in small bowl. Mix almond butter, sugar, butter and egg in a separate bowl until smooth. Add flour mixture; mix just to blend. Transfer 3/4 of dough to prepared pan. Spread jelly over bar mixture. Using fingertips or a spoon, place remaining dough on top of the jelly in uneven pieces. Bake bars until top is golden brown, about 15 minutes. Cool bars completely in pan on rack. Using foil overhang as aid to lift bars from pan. Cut into 8 squares. Serve. This post was NOT sponsored by Whole Foods. No coupons, sale items or limited quantity items were used. Who doesn't love a good challenge. I don't seem to ever be able to get out of WF for under 100. I could def use this! You have turned out some amazing food with a great price. Looks great! What a great spread for an awesome price! That is a serious skill, being able to budget and make great food. I'm taking lessons from you! I live at Whole Foods It can be done! Fabulous! Great job! The menu looks fantastic! 5 cents away! Great job! I wish there was a whole foods near me. I'd take this challenge as well! Your creativity with $10 amazes me! These all sound incredible! wow - I'm impressed! This looks fantastic for any amount, let alone 10 bucks! 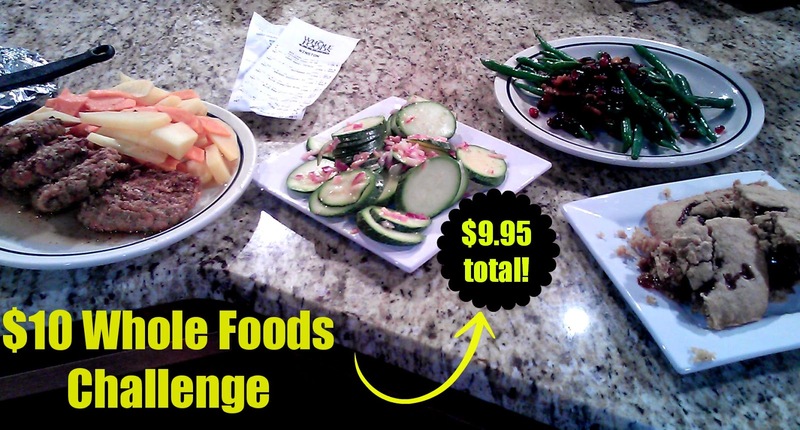 What a great challenge especially at Whole Foods, you did outstanding! I wish we had a Whole Foods!! 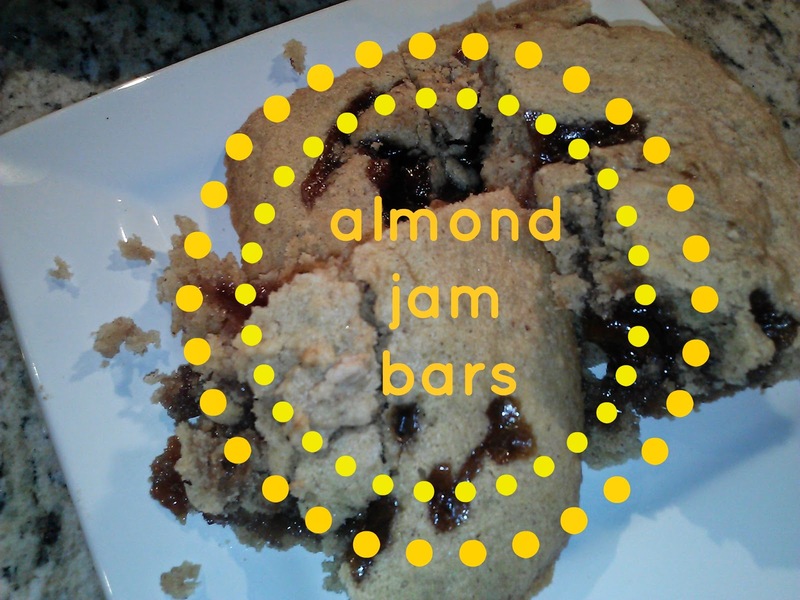 I need those Almond Jam Bars!! I cannot get out of Whole Foods without spending at least $100. I'm so impressed you threw together this delicious meal on such a tight budget! I'm really impressed that you were able to create a full meal for four on just $10 at Whole Foods!